There are 3 things you can watch forever: running water, burning fire, and Magento competing with WooCommerce. This pair of most popular platforms has occupied the market of e-Commerce solutions and millions of merchant hearts. Their epic opposition has become an infinite source of fervent blog debates where none can resist the temptation to take one of the rivaling sides. Mostly, debaters advocate the solution they use themselves justifying it with success they’ve achieved running their businesses. What are subjective opinions against objective data? Let’s turn to stats. Though WooCommerce has been demonstrating a rapid growth in the past few years, something shocking happened on May 2015. 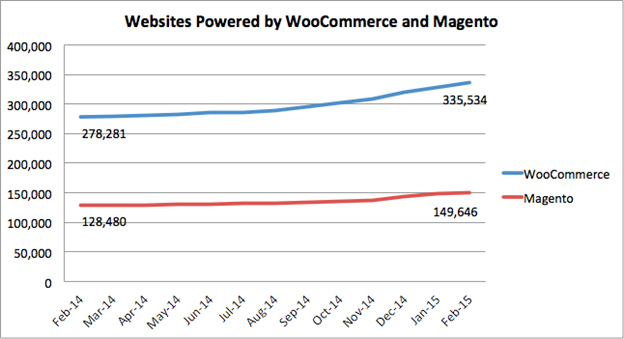 Big news: Cart2Cart service held 1% migrations more to WooCommerce than to Magento! What else could it be if not an apocalyptic sign for other platforms? 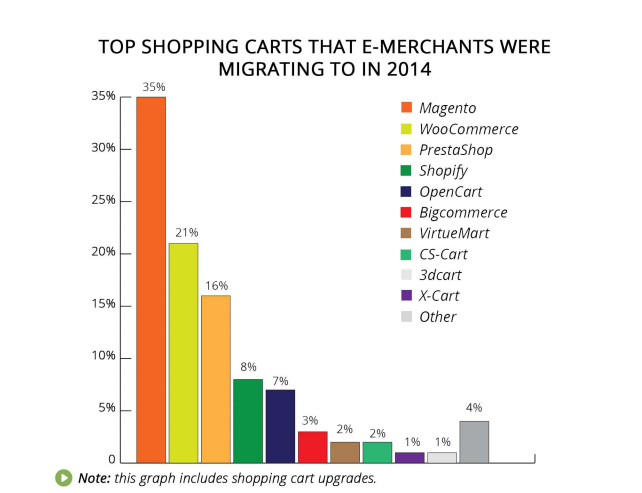 Evidently, Magento left WooCommerce far behind for no less than 14%, being a Target cart for nearly 35% of migrations in 2014. That’s the state of affairs we, Cart2Cart Team, used to. How could e-Commerce plugin for WordPress manage to make such an astonishing leap forward? 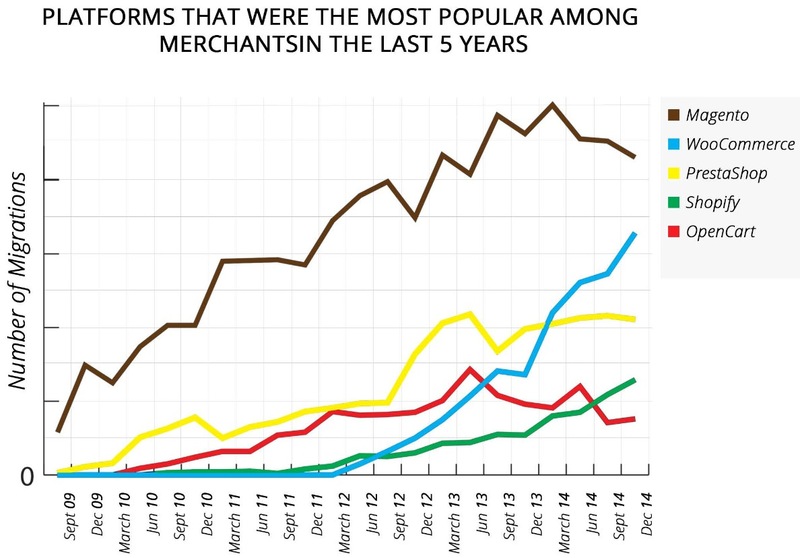 WooCommerce is a runner-up in list of top target shopping carts of 2014, whereas in 2010 it hasn’t even existed. Since WooCommerce is simpler to install, easier to manage and has a lower entry price barrier than Magento, the fact it’s ahead of the pack seems logical. Willing to sell straight away, non-tech-savvy merchants - most of the newcomers - choose WooCommerce bacause of their small/middle-sized stores. Based on the fact that the overwhelming majority of our customers are striving to find better merchandising facilities, and not platform simplifying, it can’t be the case for Cart2Cart. There is one valid explanation and conclusion of WooCommerce vs Magento rivalry - Woo has grown up and ready to offer more than it did before. Though its basic functionality is not rich as Magento ones, nearly all e-Commerce high-end features can be added with the help of available plugins. Middle-sized store owners start to prefer WooCommerce more, seeing no reasons to adapt to Magento’s complexity and sluggishness. The following chart clearly demonstrates that middle-sized stores with up to $100M revenue already use WooCommerce nearly 1% (deja vu?) more. 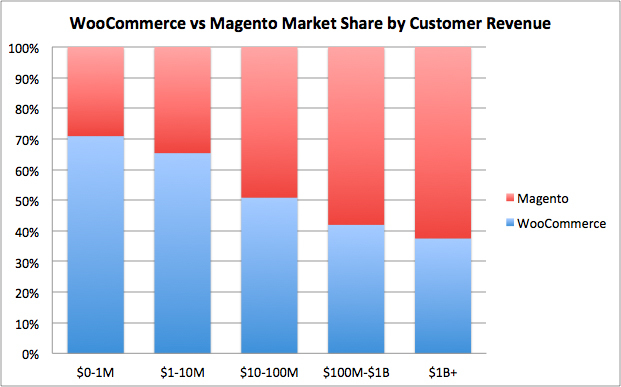 1% migration advantage over Magento could be both an accidental conjunction and a point of no return. It sounds credibly considering the fact that WooCommerce obtains merely unlimited resources, since the platform has been acquired by Automattic, the company behind WordPress.com. Why do people convert to WooCommerce? 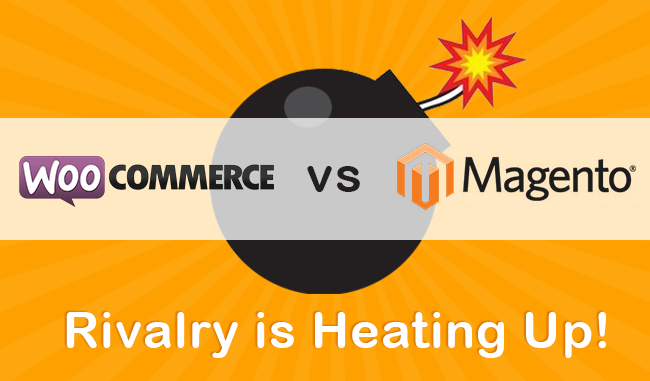 Regardless rivalry, Magento and WooCommerce have always been different to successfully coexist together. And while 1% dominance means a lot for us, that’s not what end users should bother about. However, if you want to discover what is so special about WooCommerce and switch your current platform, don’t waste your time and perform free Demo Migration! Are you fond of Magento but would love to give WooCommerce a try? Perform a seamless WooCommerce to Magento migration! Or, perhaps, you wish to take use of Magento’s unlimited functionality? Go with an automated Magento to WooCommerce migration!